When you think of funeral flowers, chances are good that you imagine standing sprays of lilies, gladiolas, roses, carnations, and chrysanthemums in white or pastel colors. Perhaps you would like to consider something different for your loved one who has passed on. Fresh flowers at a funeral have always been a way to express love, sympathy, and memories in a way that words cannot; they still are, but in today’s world, we are not limited to traditional funeral flowers. In modern times, there are no inappropriate funeral flowers, and I think this helps us to express and communicate feelings even more accurately. For example, brightly colored bouquets can celebrate a person who was cheerful and vibrant in life; exotic flowers can represent a person who loved to travel; a sunflower arrangement can serve to honor someone who loved to grow sunflowers. Here are five non-traditional funeral flowers you may want to consider. The exotic bird of paradise flower makes a striking arrangement, especially when paired with other exotics, like orchids, anthuriums, and bromeliads. 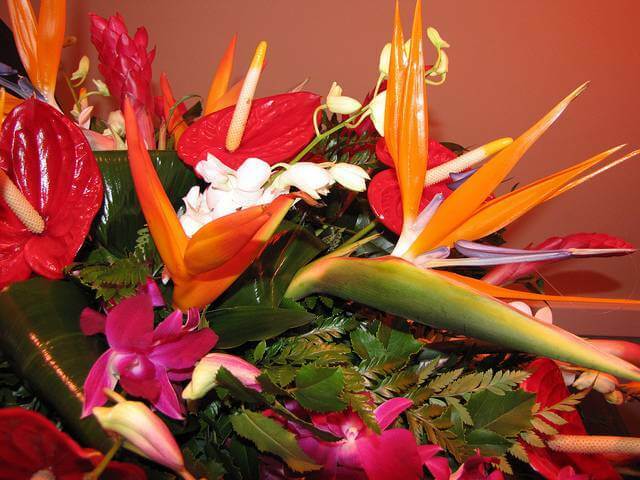 I have seen several stunning modern, subdued arrangements with bird of paradise flowers, and I have seen them included in bouquets of more traditional, brightly colored flowers as well. I think this flower is a great choice for people who loved to travel in life or loved to vacation in the tropics or for someone with an unusual and vibrant personality. One of the meanings of the bird of paradise flower is joyfulness. To me, I envision the deceased’s spirit flying joyfully, free of the confines of this world’s troubles. Bird of paradise can also celebrate a joyful life well-lived. 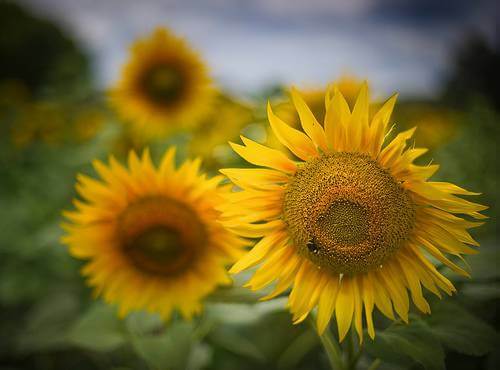 In the past, you didn’t see many sunflowers at funerals and visitations, but that is changing. I think the change is due to the fact that so many people are starting to see funerals as a time to celebrate a person’s life rather than a time of mourning. Again, arrangements can be a traditional large bouquet of gladiolas and roses with a few sunflowers, or it can be contemporary – for example, a grapevine wreath filled with sunflowers and a variety of other bright, cheerful flowers. Sunflowers represent pure love and adoration. I don’t see many sweet pea funeral arrangements, and I think that is a shame. They make a perfect bouquet to send to family members of the deceased, and they also look beautiful in a casket spray. They come in such a wide variety of colors that they easily fit into any theme, and their unusual shape adds interest to any arrangement. They are especially a good idea for a loved one who liked to grow them in the garden. 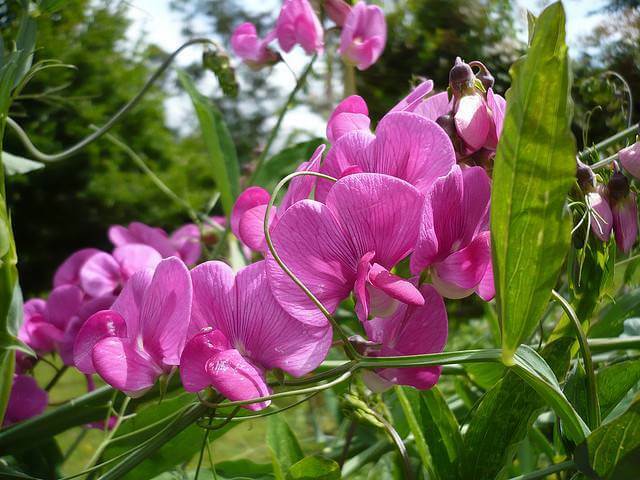 Sweet peas represent goodbye and departure in the language of flowers – how fitting for visitations and funerals. Image via Flickr from Ernest McGray, Jr. The exotic protea flower is one of the oldest on earth and one of the most versatile. Some look like beautiful, colorful artichokes in form, while others look like bottle brushes or dahlias. 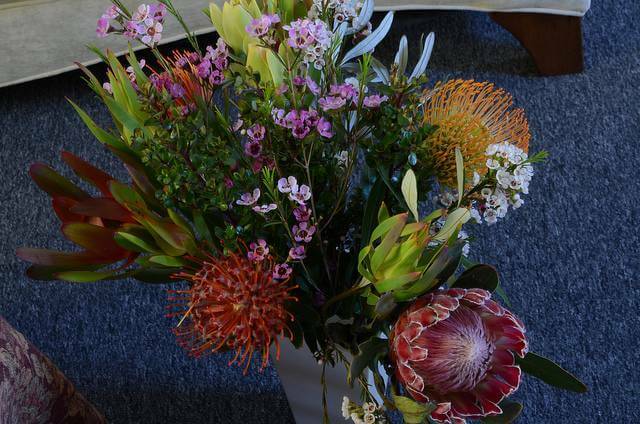 When proteas are used in funeral arrangements, they are often paired with other exotic flowers such as anthuriums and bird of paradise to create truly unique and spectacular displays. However, I have seen them mixed in with more typical flowers as well. I think protea flowers honor a strong person who lived a truly extraordinary life. The protea flower represents courage, diversity, and transformation. The meaning of transformation is especially applicable to death in many cultures and religions. 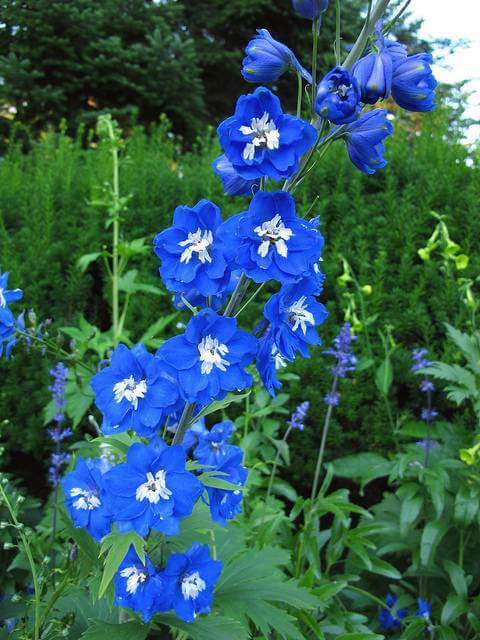 Delphinium is probably the most commonly used funeral flower out of the non-traditional flowers that I have listed. You see it occasionally, usually tucked in with a large spray of other flowers. I think it is beautiful used in mass as a focal point. It is one of the few true blue flowers, and the form of the tall spikes is perfect for large standing sprays or casket sprays. It’s a great flower for people who loved the color blue, and it is a very tranquil and relaxing color for people mourning a loved one. Adding to the flower’s charm is its meaning, which is “all things heavenly” in the language of flowers.